One of the great advantages of providing Montana fly fishing trips in the Greater Yellowstone area is the large diversity of fishing waters found in our region. Although large rivers like the Madison, Gallatin and Yellowstone deservedly draw a lot of attention, some of Montana's most unique fishing can be found on streams and ponds on large ranches in the region. 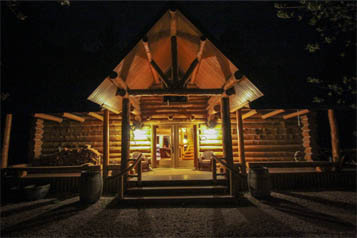 Many of these land owners have generously offered permission to our guests to access their ranches and enjoy unique opportunities for stillwater fishing for trophy trout as wells as secluded small stream fishing. We have access to numerous ranches in Southwest Montana and the each offer a unique fly fishing experience. Permission is always limited when we are fishing private access waters. We generally charge a trespass fee for most ranches in the region that we pass along to the ranch owners. Several of the ranches we visit offer outstanding opportunities to hook and land trophy trout up to 28". Other locations provide fast action and high catch rates. Some locations, such as spring creeks, offer challenging and technical fishing over prolific insect hatches. A fishing trip to one of Montana's working ranches is one of the best ways we can think of to experience the Big Sky State! Battle Creek is a small meadow stream located on a very large and remote ranch directly west of Ringling. Montana Angler has exclusive access to the ranch for fishing purposes. Battle Creek is an outstanding dry fly fishery for smaller rainbow and brook trout. There is over 10 miles of stream that is easily wade fished along with a few smaller tributaries. Battle Creek is roughly an hour and a half from Bozeman, Montana. Montana Angler has exclusive access to the Middle, South and Main forks of the American Forks Creek which drains the Northern Crazy Mountains. The fisheries are located deep within a massive 30,000 acre ranch. Montana Angler has access to over 15 miles of Big Elk Creek. This amazing little trout stream starts high in the northern Crazy Mountains and flows north until it joins the Mussellshell River. It offers exceptional dry fly fishing opportunities for both brown and brook trout along with incredible scenery. The Musselshell River in Central Montana offers a secluded setting and a chance for some nice sized browns. This medium sized river is a wade fishery and offers one undercut bank after another. Sixteen Mile Creek is a remote small stream dry fly fishery that is steeped in history. Located on a large private working cattle ranch it boasts easy drive along access via the old railway. Sixteen Mile Creek boasts an amazing fish population with the chance at some trophy Brown trout each day. When most folks talk about the world famous Beaverhead River, they are referring to the upper stretch of the river just below Clark Canyon dam. This stretch of river fishes very well, but is prone to crowding. This crowding drops off dramatically as you move downstream, as boat ramps are few and far between and the river is locked up in large private ranches. Montana Angler has access to this lower, uncrowded stretch of the Beaverhead. Burns Lake is a small, 30 acre reservoir near Big Timber that offers terrific fishing to very large trout. Rainbows, Browns, and Brook Trout are all present in the lake, with many specimens stretching over 20". The wide open vistas of the valley and the Crazy mountains are always impressive. The East Gallatin River is a smaller river that is a very productive wade fishery. It is located very close to Bozeman, MT and makes for a very easy and convenient day trip. Montana Angler has access to a private ranch in the area and approximately 2 miles of the East Gallatin. The East Gallatin is a technical fishery and spring creek style techniques are often employed. Located near the small town of Checkerboard, MT, Flagstaff lakes offer high quality stillwater fishing with a spectacular back drop. Both the upper and lower lake sit in a small bowl surrounded by open hillsides that give way to timbered ridgetops. Elk and deer are sighted frequently while fishing on the lakes. The upper lake is home to Rainbows as well as some of the biggest, most beautiful Brook Trout you will find in Montana. The Hanson Lake's are located on a large ranch just south of White Sulphur Springs, MT. There are two lakes on the property, and each are filled with extremely hard fighting Rainbow Trout in the 18-22" class. These fish will make hard charging runs and are not afraid to put on an aerial show. Jones Lake is a trophy trout lake located in open country just east of the Crazy Mountains. The vistas of the open ranch land with Crazies in the background are always a hit with visitors. Jones Lake contains a hard fighting strain of Kamloops Rainbow Trout that grow up to 10 pounds in the fertile waters of the lake. Mill Creek is a small tributary to the Ruby River outside of Twin Bridges, MT. It is heavily spring influenced, so it is a sort of hybrid between a spring creek and a freestone meadow stream. Mill Creek is a Brown Trout fishery, and the fish grow quite large for such a small stream. Fish from 12-15" are common and they range up to 18" and beyond. The stream has intermittently brushy banks surrounded by open ranch land and wetlands. Nelson Lake's are a group of three lakes that sit in the rolling hills just above the North Fork of the Musselshell River. The lakes are surrounded by the open hills that gradually fade into forested ridgelines. Elk and deer are frequently sited on the property. All three lakes contain good sized Rainbow Trout that can exceed 20" on occasion. There are some things better left off of the internet. Montana Angler has several private leases on some streams that will remained unnamed here. These are mostly small stream fisheries that cannot handle much fishing pressure and we don't feel the need to publicize. In general, these streams will fish best during the summer months and are excellent dry fly streams. Don't expect huge trout, but do expect great action and larger fish than most people would anticipate given the size of the water. The North Fork of the Musselshell is a small tailwater fishery located below Bair Reservoir. Montana Angler has access to over 10 miles of the stream, which is located east of White Sulphur Springs, MT. Extensive stream and habitat restoration has taken place over the years, returning this once neglected stream into an outstanding fishery. Montana Angler has access to several miles of this productive small stream above Sutherlin Reservoir. Located east of White Sulphur Springs, the creek is set in the bottomland surrounded by open fields in the middle of a large ranch. Elk are often seen grazing on the hillsides that rise in all directions and wildflowers are plentiful in the early summer. Montana Angler has access to several miles of the lower Ruby River outside of Twin Bridges, MT. Public access is scarce on the lower river so the trout here see very little pressure. The lower Ruby is classic meadow water. It twists and turns endlessly throughout the ranch, creating high, undercut banks. These undercut runs and the riffles that lead into them are primarily home to Brown Trout. This small but productive wade fishing river holds some surprisingly large trout. It is the perfect size: easy to wade but large enough to hold good fish. Smith Creek is a tributary of the East Gallatin River and in many ways fishes just like a miniature version of the larger river. Montana Angler has access to several miles of Smith Creek, which is conveniently located very close to Bozeman. The stream lies in the heart of the Gallatin Valley with sweeping views of four different mountain ranges. The South Boulder River is a small tributary that joins the Jefferson near Cardwell, MT. The South Boulder is primarily a Brown Trout fishery with a smattering of Rainbows thrown in. Public access is scarce on the South Boulder, meaning the fish do not see much fishing pressure. The water is well suited for dry fly fishing. Long, choppy riffles and glides give way to deep bends along grassy banks. A fantastic small stream that drains the rugged Crazy Mountains, Sweet Grass Creek is our home water at the Sweet Grass Basecamp. Montana Angler has permission to access to several miles on the WD Ranch, a 25,000 acre cattle ranch near the small town of Melville, MT. This is dry fly country, and the fish rise eagerly to various attractor patterns and terrestrials. Willow Creek is a small tailwater stream located below Harrison Reservoir and is an easy day trip from both Bozeman and Ennis. The stream is located at the bottom of a beautiful canyon and can only be accessed after a 4x4 drive across a private ranch and a short hike. Getting to the creek is a real adventure! Once at the bottom of the canyon, anglers have access to miles of productive pools and runs.